Stakes provided by the faithful help prop the Bodhi tree at Wat Phra That Lampang Luang. 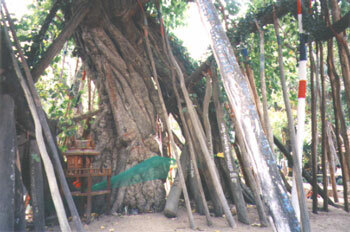 The Buddha achieved Enlightenment while meditating under a Bodhi tree, and some trees in Thailand are said to be derived from cuttings of that tree. A Spirit House resides beside the tree. Spirit houses are common in Thai homes. They are placed before construction of the building, to placate the spiritual guardians of the property. They are adorned with incense, flowers, and food, on a regular basis. This practice predates Buddhism.